You'll find exchange houses everywhere in Cozumel. Look for the sign that say "Money Exchange". Peso bills come in 10, 20, 50, 100, 200 and 500 denominations. The bills are different colors and easy to tell apart. 1,2, and 5 peso coins are round - silver with a golden center. 10 and 20 peso coins are also round, but golden on the outside. Each smaller denomination round peso coin is physically smaller than higher denomination coins. A peso is worth 100 centavos - just like a dollar is worth 100 pennies. The centavo pieces are one color and octagonal shaped and come in 10, 20 and 50 denominations. These are actually rare to see, but becoming more common, so keep your cute little silver 10 centavos for souvenirs. Mexico's currency is the Mexican Peso (sometimes referred to as the New Peso (Nuevo Peso), since Mexico re-valued its currency in 1994. There are one hundred Mexican cents (Centavos) to every peso. So 5000 in old pesos is worth 5 new pesos, about $0.50 US. Not exactly worth exchanging. The old peso is very common, so it there is no cash value for collectors. 20 peso note. The newer version is made of plastic paper. There is also a 20 peso coin that is gold color. 50 peso note. This bill is commonly seen. The newer version is made of plastic paper. 100 peso note. Probably the most common you'll see today. 200 peso note. Very commonly seen, especially in cash machines. 500 peso note. They are more difficult to obtain. 1000 peso note. Rarely seen. Few in circulation. 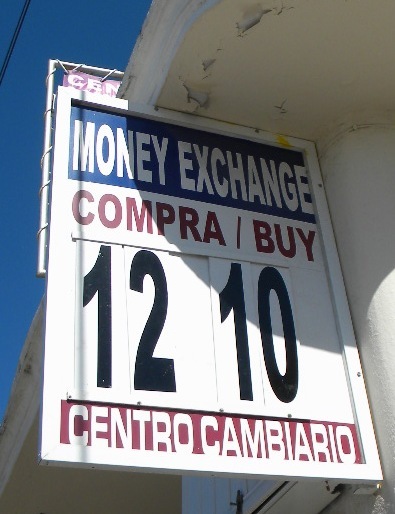 Most foreign currencies can be exchanged for Mexican pesos at money exchange places, which generally offer more flexible business hours and faster service. Hotels offer the least favorable exchange rate, while the best rate is available at money exchange places. Traveler checks can be cashed at a slightly lower rate than currency. To check out the current exchange rates, click here and follow the instructions. Although Dollars are widely accepted in most Mexican tourist centers, we suggest that you use Mexican Pesos during your visit. ATM machines are available all over town. Most of them only give you pesos, but some will ask you what you prefer. These machines give good exchange rates. Some banks have a fee for the service that will be charged to your account. Visa, Mastercard, and American Express cards are widely accepted. Many establishments will charge you an additional 4%-8% above the cost of the service or goods you bought. Please check to see if there are additional costs before you use your card. Mexican merchants will not accept a bill if it is even slightly torn or damaged. You need to watch the bills when you receive change to make sure you can use them again. If your cash is stolen, there is not much you can do unless you have an insurance policy. If so, you will need to get a police report to make your claim. If your credit card is stolen, you will need to call your bank or the credit card contact number and report it missing. Failure to do so may make you responsible for all charges relating to that card even if they aren´t yours. If you find anything that isn´t yours, please turn it in to our office and we will do our best to return it to its rightful owner.